The city of Englewood serves as the western boundary for a large portion of Englewood MetroPark. This nature-filled park, one of the largest in the region, has been part of the Englewood community for more than 50 years. Generations of residents continue to enjoy picnicking, walking, running, fishing, cycling and wildlife observation in the park’s woodlands and meadows along the banks of the scenic Stillwater River. Each season highlights different wonders of nature, including spring wildflowers, plants and trees dressed in full foliage in summer, the warm colors of fall leaves and frozen waterfalls in winter. North Park fishing ponds are open 24/7 Apr. 1-Oct. 31. for fishing only. The lake on Martindale Road is open 24/7 year-round for fishing only. The northern segment of the Stillwater River Trail, commonly known as the Grossnickle Bikeway, connects the City of Englewood’s Grossnickle Park to Englewood MetroPark. Heading North from Grossnickle Park, the trail passes through the relief spillway of the Miami Conservancy District’s earthen dam, along the base of the dam. The trail winds its way through Englewood MetroPark, where visitors can enjoy hiking, picnicking, fishing, nature play, and even an 18-hole disc golf course. Learn more about the Stillwater River Trail. Tucked away in Englewood MetroPark is a unique woodland area, a remnant swamp forest. Visitors can follow the yellow trail from the trailhead in East Park that will lead to a boardwalk into this wet area. The area supports an unusual population of trees, including black ash, swamp white oak and pumpkin ash. This remnant swamp has been dedicated as a State Natural Landmark in recognition of the occurrence of pumpkin ash, a tree rarely found in Ohio. Englewood MetroPark is home to three waterfalls: Martindale, Patty and Oaks. Treat yourself to a hike on the green trail and discover Martindale Falls, a breathtaking view of a limestone and shale ridge top, which plunges into a wide, rocky undercut ravine. Continue your hike across Patty Falls, named for the Patty family who settled nearby. Here you’ll see the wide rocky wet weather falls along with a side cascade that merrily trickles all year long. Follow the trail across Patty Road for a view of the smaller Oaks Falls. The green trail loop also takes you along the Stillwater River. Many of the trees in the forested areas Five Rivers MetroParks protects have been around much longer than MetroParks, the city of Dayton — even the state of Ohio! Imagine all the changes these old trees have seen. Visit “Big Blue,” a champion blue ash tree, at Englewood MetroPark. You’ll find Big Blue just past the stone gate entrance to the West Park area, found at 100 East National Road. Located in East Park is Englewood’s Blue Heron Disc Golf Course. Follow the signs to the 18-hole course positioned under mature trees next to the lake. The course has mowed fairways on rolling hills that are surrounded by a foot of rough. Dense forest with vast wildlife envelops the park, creating a peaceful and enjoyable experience. It features Fly18 Concrete tee-pads with DisCatcher baskets. Englewood MetroPark is one of the best birding sites in the area. Approximately 90 percent of all species seen in the Dayton area have been observed in Englewood. The presence of wetlands in the Benedict Blincoe Wildlife Observation Area that readily supplies worms, crayfish and other favorite food sources for birds are likely responsible for its popularity. This large wetland was formed after the shallow lake filled with silt from the Stillwater River. Migrating birds can be seen feeding there during the spring or fall, including sandhill cranes. Other birds in this park include owls, eagles, warblers, great blue herons, belted kingfishers, a variety of ducks, cedar waxwings and Baltimore orioles. Beaver, muskrat and raccoons also visit wetlands to find food. All restroom facilities at Englewood MetroPark are ADA accessible. There is accessible parking available along with an accessible nature trail in the Patty Shelter area. There are four accessible drinking fountains located in Englewood’s East Park: one at the Disc Golf course, one in the Patty area and two in between those locations. West Park has a drinking fountain near each of the two shelters. Drinking water is not available at Englewood’s North Park, South Park or campsites. Take Route 16 north from downtown. From the bus stop at Main Street and National Road to the interior of Englewood MetroPark’s West Park is approximately a three-quarter mile walk. The park is accessible by foot or bike on the Stillwater River Trail. Flushable restrooms are located in Englewood’s West and East parks (near Patty Shelter) and open to the public April through October. Portable toilets will be available near those sites November through March. There is a large pit toilet available in East Park near the disc golf course. Outhouses are located at Englewood’s South Park parking lot and also available for the campsites. Portable toilets are located in Englewood’s North and Aullwood Garden parking lots. All restrooms are ADA accessible. The lakes at Englewood’s North Park offer fisherman the opportunity to get out on the water to angle. Rowboats and electric-motor boats are permitted. in the largest lake to the west of the drive.There is a boat access ramp for the largest lake to the west of the drive and a grassy area designated for offloading small watercraft into the east lake. Englewood offers four frontcountry campsites near woodlands, meadows and waterfalls. Built-in activities include more than 20 miles of hiking trails through a wide variety of forest habitats, prairies and beautiful waterfalls, fishing and paddling opportunities on the Stillwater River, a disc golf course, a nature playground and a spot for fossil collecting. Bring your bikes! The Stillwater Trail offers nearly 2 miles of paved bike path through the park. Picnic table, vault toilets and firewood are provided with your camping permit. The natural areas of Englewood MetroPark contain a great diversity of habitats in the valley of the Stillwater River. The park contains outstanding examples of bottomland hardwood forests (on the green trail along the river), old-growth upland forest, an oak and pumpkin ash swamp and former farmland in natural succession. A large wetland provides outstanding bird and wildlife habitat. The Stillwater River bisects the park and contains excellent aquatic diversity. Because of the size and diversity of the habitats here, the park has been designated by the National Audubon Society as an Important Bird Area. In 2009 to promote river recreation, MetroParks removed a dangerous low-water dam on the Stillwater 80 years after it was built. Over the decades, silt choked the river upstream of the dam and reduced the park’s lake depth to less than 1 foot in places. The low dam destroyed some of the ecological culture of the river, as well, lining the river bottoms with mushy silt and inhibiting fish. Since the dam’s removal, the mussel and fish populations have rebounded. In the removal process, contractors were careful to preserve nearby Indiana bat roosting trees. Patty Road through the main park is marked with a bike lane and offers scenic cycling. The northern segment of the Stillwater River Trail, commonly known as the Grossnickle Bikeway, connects the City of Englewood’s Grossnickle Park to Englewood MetroPark. Heading North from Grossnickle Park, the trail passes through the relief spillway of the Miami Conservancy District’s earthen dam, along the base of the dam, and winds its way through Englewood MetroPark, where visitors can enjoy hiking, picnicking, fishing, nature play and even an 18-hole disc golf course. North Park Ponds: The best places for trophy largemouth bass are the ponds in the north part of Englewood MetroPark. Fishing surveys found numerous bass weighing more than 6 lbs. each. Ice fishing is permitted in the north park (off of Old Springfield Road), but ice conditions are not monitored. Englewood North Park is open 24/7 (for fishing only) from April 1 until October 31. Martindale Road Lake: This is the best location for total numbers of crappies. The lake on Martindale Road is open 24/7 year-round for fishing only. Stillwater River: For those interested in smallmouth bass, the pool below Englewood dam has yielded several fish in the 14- to 16-inch range during recent wildlife surveys. The river is a premier smallmouth bass fishery. East Park Lake: This shallow lake is slowly filling with silt from the Stillwater River and becoming a wetland. In spring when water is high, the lake can be used for fishing. Fishing is not permitted at the South Park Pond or North Park “Wildlife” pond. Englewood’s East Park green trail is the park’s longest, at 3.8 miles. It travels by amazing natural scenery such as Martindale, Patty and Oak waterfalls, the pumpkin ash and swamp forests as well as the waters of the Stillwater River. Other trails in the park can be combined with the green trail for a total of more than 20 miles. Patty Road through East Park is marked with a bike lane and offers scenic views on a paved surface for walkers, runners and inline skaters alike. The northern segment of the Stillwater River Trail, commonly known as the Grossnickle Bikeway, connects the City of Englewood’s Grossnickle Park to Englewood MetroPark. Heading North from Grossnickle Park, the trail passes through the relief spillway of the Miami Conservancy District’s earthen dam, along the base of the dam, and winds its way through Englewood MetroPark. Englewood MetroPark is one of the best birding sites in the area. Approximately 90 percent of all species seen in the Dayton area have been observed in Englewood. Look for great blue herons, belted kingfishers, a variety of ducks, cedar waxwings and Baltimore orioles. Englewood MetroPark has a variety of habitats including woodlands, meadows and wetlands. The Stillwater River, lakes and ponds invite waterfowl, including sandhill cranes. Other birds in this park include warblers, hawks, owls and an occasional eagle. Beautiful spring ephemerals are found in Englewood’s bottomland forest on the green trail along the Stillwater River. Look for trout lily (Erythronium albidum), a white-flowered plant with speckled leaves resembling the speckled skin of trout. Coyotes are often observed in the prairie areas. Englewood MetroPark has several unique geocaches, making it a great place to spend the afternoon. Geocaches will take you to unique natural features and give you a taste of history. Visit geocaching.com to get coordinates for all geocaches hidden in Five Rivers MetroParks. Picturesque Patty Falls, named after the Patty family who settled nearby more than 150 years ago, is an easily reached scenic spot. From the falls, a short hike down the hill leads to a bridge over which Old National Road passed (near trail intersection 21). Note the limestone blocks and oak planks used in construction. Englewood Dam is part of a system of five earthen flood control dams built and managed by the Miami Conservancy District after the flood of 1913. Construction of the dam began in February of 1918 and was completed in December of 1921. The park opened to the public on April 1, 1967. The land, part of the Stillwater River flood control system created in 1922 by the Miami Conservancy District, was leased to MetroParks 1966. Enjoy more than 20 miles of scenic trails. Located in Englewood’s East Park, the green trail is accessible near Patty Shelter for a scenic hike through beautiful woodlands and a pumpkin ash and swamp forest. The trail takes you by three unique waterfalls. 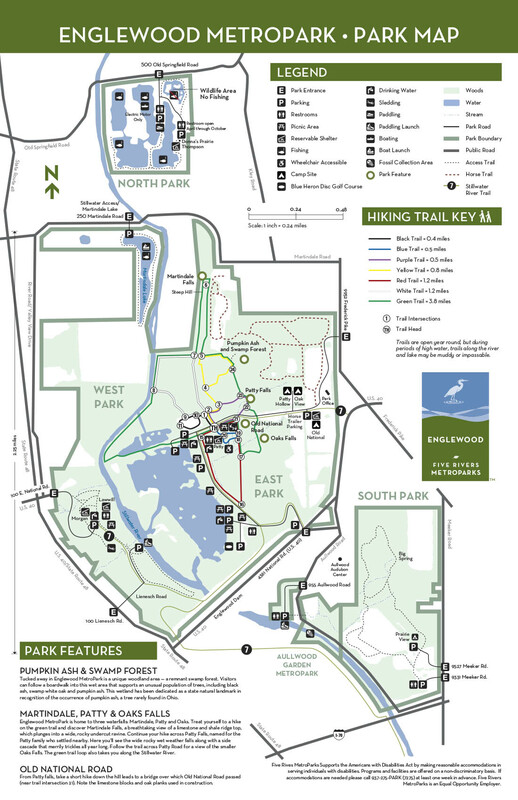 The East Park trails are color-coded loops with intersections marked by a number corresponding to numbers on the inside map. Loops range from on-half to 3.8 miles and can be combined for additional mileage. Bring a horse and ride nearly 3.5 miles of scenic bridle trails. Englewood features wide paths that allow for riding side by side. The trail’s long, flat stretches are good for canter work. Horse trailers may be unloaded in the parking area south of the park office near Camp Old National. Overflow parking is permitted at the adjacent park office. Rentals are not available. Horseback riders must remain on designated bridle trails. The natural areas of the park contain floodplain forests, large areas of former farmland in natural succession, second-growth upland hardwood forest, significant remnants of mature and old-growth forest, prairies, a large wetland, several managed grasslands and the scenic Stillwater River. The park also contains a series of rehabilitated gravel quarries along Old Springfield Road. Every birdwatcher should know about the wildlife/wetland viewing opportunities at Englewood MetroPark. Since the low dam was removed from the Stillwater River, populations of fish species have increased and diversified, attracting birds such as green and blue herons, raptors and water fowl. Drive across the Englewood Dam to the entrance at 4361 National Road and sit along the banks overlooking the wildlife/wetland conservation area. Because of the size and diversity of the habitats here, the park has been designated by the National Audubon Society as an Important Bird Area. Enter at the Aullwood Garden parking lot entrance at 955 Aullwood Road and search for fossils south of the Englewood Dam. Collecting fossils is permitted only in the marked area located along the Stillwater River. Follow the rules posted at the site. Have you ever been to the South Park at Englewood MetroPark? Head to the entrance at 9527 Meeker Road and hike the trail past Prairie View campsite to find Big Spring. Big Spring draws water from the nearby Stillwater River. Explore the moss-covered rocks and search the muddy spots for animal prints. Continue on the trail and observe large areas of former farmland in natural succession, second-growth upland hardwood forest and prairies. The nature play area provides a place for kids to explore, build forts, count bugs and use their imagination in unstructured outdoor play. There are comfy chairs for caretakers. It’s also a short hike to see Patty Falls. Enter East Park off U.S. 40 and follow the signs for Patty Shelter through the park until you come to the Patty parking lot. There you will find a trailhead with several color-coded loop trails to explore. The nature play area is next to Patty Shelter. Located in East Park is Englewood’s Blue Heron Disc Golf Course. Follow the signs to the 18-hole course positioned under mature trees next to the lake. The course has mowed fairways on rolling hills that are surrounded by a foot of rough. Dense forest with vast wildlife envelops the park, creating a peaceful and enjoyable experience. It features Fly18 tee-pads with DisCatcher baskets. Popular trips begin north on the scenic Stillwater River and conclude at Englewood MetroPark. Trips south of the dam are also possible. Watercraft are not permitted through the dam. With sufficient snow fall, cross-country ski the hiking trails and picnic areas. Englewood MetroPark’s sledding hill is located in the West Park. Use the 100 E. National Road entrance (U.S. 40 at State Route 48) and follow the park road for parking. There is a short walk through the woods to the hill from the parking lot. The entrance to the wooded trail is signed at the south end of the parking lot. There’s lots of room to have multiple launches for races or stunt competitions. Ice fishing is permitted in North Park (off of Old Springfield Road) and Martindale Lake (off of Martindale Road), but ice conditions are not monitored. An Ohio fishing license is required. Hiking trails are open all winter long in most MetroParks, including Englewood. Englewood MetroPark is 1,900 acres of lakes, woods, wetlands and meadows. With its floodplain forests and wetlands, Englewood MetroPark helps to buffer and protect the Stillwater River.